10.25% JM Financial Credit Solutions Limited NCD - Nov'18 – Should you Invest? 10.25% JM Financial Credit Solutions Limited NCD – Nov/Dec’18 – Should you Invest? 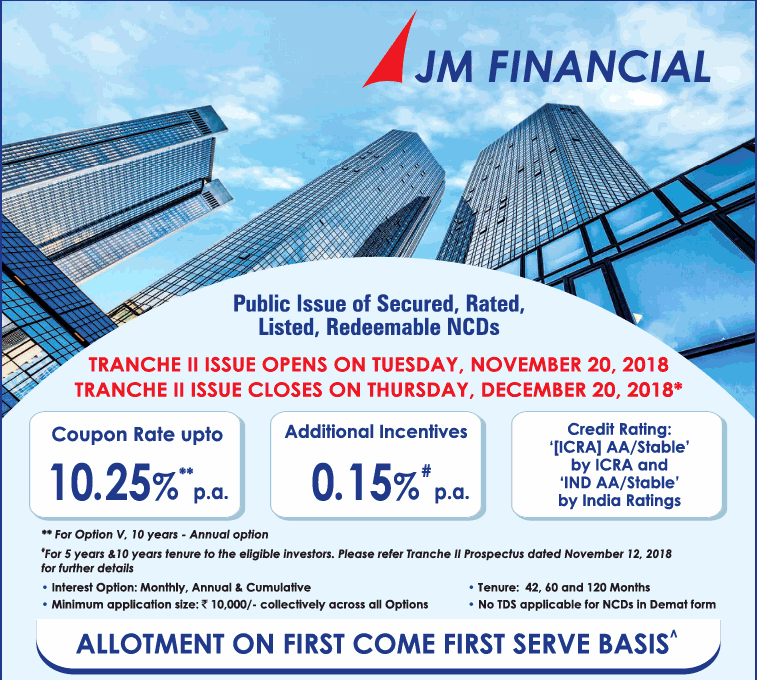 JM Financial Credit Solutions Limited has come out with public issue of non-convertible debentures (NCD) offering up to 10.25% interest rate. The issue opens on November 20 and closes on December 20, 2018. JM Financial Credit Solutions Limited, a venture between JM Financial Limited holding 50.01% and INH Mauritius holding 48.62% is a non-banking finance company with a focus on residential project financing such as funding real estate developers at various stages in the life cycle of a real estate project. The product portfolio consists of Project Finance, Loans against property, Loans against shares, Project at early stage loans and Loans against land. There are 6 options of investment in JM Financial NCD. JM Financial NCD – Who can Apply? NRIs cannot apply for this NCD. The banks have started increasing interest rates on fixed deposits and hence it may not be good idea to invest for long term. For people in highest tax bracket Tax free bonds are trading at yields of 7% to 7.2% – which would turn out to be better and more secure investment. The problem is its not easy to buy due to very limited liquidity. Its good idea to remain invested till maturity because liquidity on exchanges are low and hence you would get lower than market value. If you plan to invest in this issue, do it early as most good NCD issues are over-subscribed before the end date. 10.4% Manappuram Finance Limited NCD – October 2018 – Should you Invest? 9.20% Indiabulls Commercial Credit Ltd. NCD – September 2018 – Should you Invest? 9.10% Tata Capital Financial Services Ltd NCD – September 2018 – Should you Invest? 9.75% JM Financial Credit Solutions Limited NCD – May/June’18 – Should you Invest?